We received a surprise in the mail this week! Our Painted Lady caterpillars arrived! The children were so excited to see them crawling around in their little cups! It's interesting to learn about why they spin a web (to help them move around) and why they seem to shed their end (because they are outgrowing their exoskeleton and are growing bigger). We passed them around the circle and examined them up close! The children have been helping create our interactive caterpillar display. 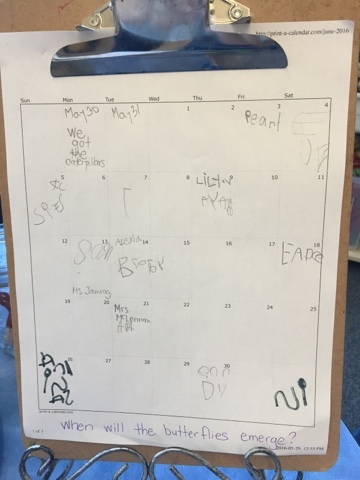 Many children wrote their name on our June calendar to predict when they thought the caterpillars would emerge from their cocoon. Some of our children read about the Painted Ladies to see how long their transformation would be so they could have an accurate prediction! The children drew pictures of what they thought the caterpillars would look like as butterflies. 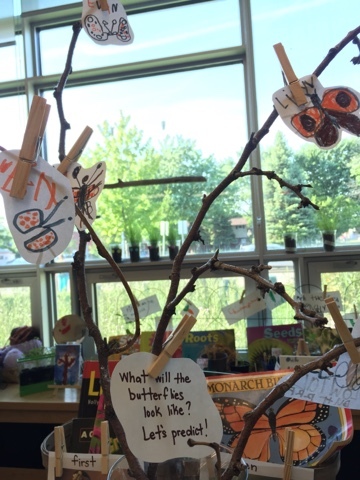 We had not yet done research on Painted Ladies when the drawing were made so it's interesting to note that many children appeared to use their prior butterfly knowledge and made theirs look like Monarchs. 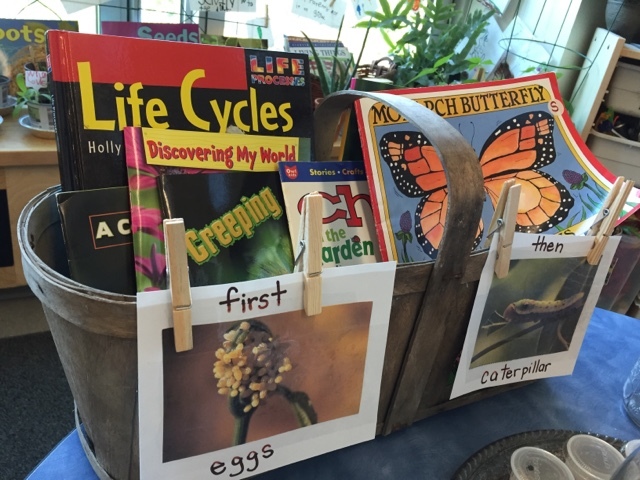 We have many books about butterflies, caterpillars and lifecycles in an appealing rustic basket. 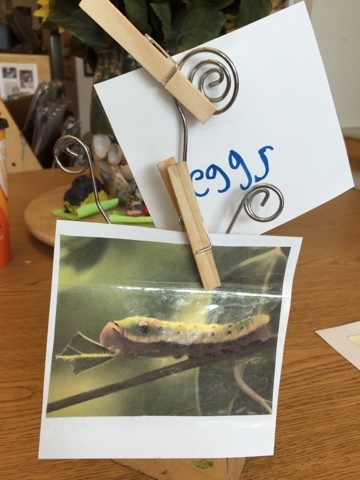 The stages of the lifecycle are pinned to the sides for easy display and access by the children. 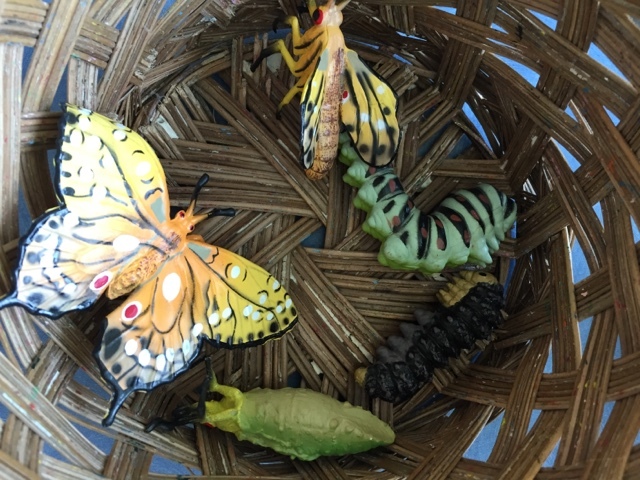 Fun mini manipulatives showing the different stages of the caterpillar/butterfly have been fun to play with in our mini playscapes as well as sequence to tell the story of the lifecycle. 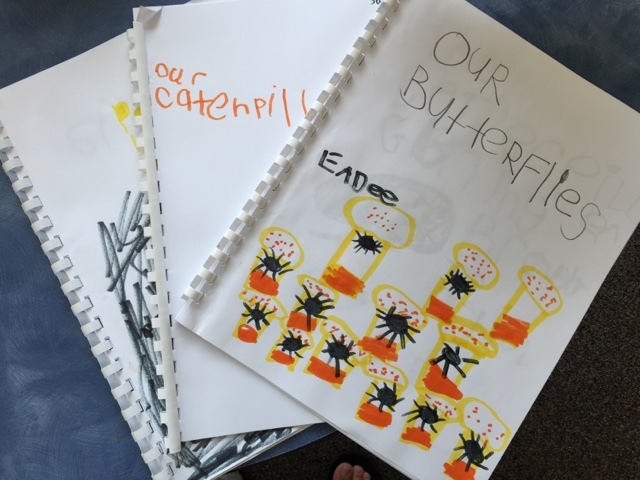 Similar to our planting journals, the children are recording their ideas and observations in the form of communal butterfly journals. Whenever a child would like to share their thoughts they are invited to add a page to these booklets. We also have lifecycle specific vocabulary cards that the children can access when writing in the journals. These have pictures on one side and kid print on the other for easy writing support. Children can copy the word directly or refer to it after sounding it out independently. 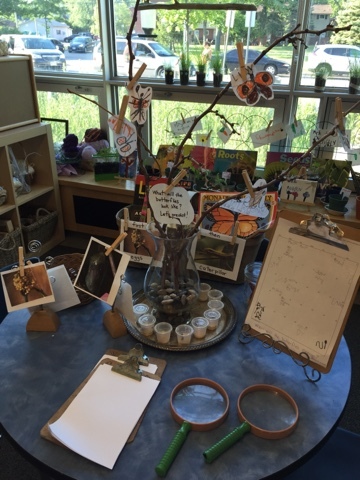 We can't wait to add more child-created materials to the centre as the caterpillars develop and we have deeper understandings of this wonder! This is great! I love how attractive and focussed your provocations are. It was delightful to read your post. I could feel the excitement experienced by you and the children. It took me back to my classroom days when we would keep caterpillars and watch them grow, pupate, and then emerge as beautiful butterflies. It was almost magical to be able to watch them go through each moult and instar stage until they formed their chrysalises. Then we would wait patiently until they emerged. Sometimes we were very fortunate that they decided to pupate when we in class. When we saw them form a j-shape we knew pupation would occur within the next few hours. Someone would always be tiptoeing over to look, and as soon as the caterpillars started to wiggle, we knew it was about to happen. We’d all gather about quietly to watch the transformation as the caterpillar removed its last skin to become a chrysalis. It happened so quickly but it was amazing to watch; an event that is unlikely to be viewed “in the wild”. We found that most often the butterflies would emerge in the mornings; but sometimes we were lucky and they would delay until the children had arrived at school. Then we would be able to watch them emerge, and pump up their wings with the fluid that had been stored in their plump bodies. When their wings had dried and they were obviously getting ready to fly, we would very carefully pass them from child to child before releasing them. Sometimes everyone got to hold a butterfly. Other times the butterflies were ready to go and were out the window and away before giving us a chance. We had to time it just right – when the wings were dry, but before they were totally ready for flight. The children loved this experience, as did I.
I love that you have information books available for the children to read and lifecycle specific vocabulary cards available for them to access and refer to. It is easy to develop misconceptions with exposure only to fiction where the emphasis is on the story rather than the accuracy of the science. But even these provide opportunities for developing critical literacy, especially when the children are more knowledgeable than the author! 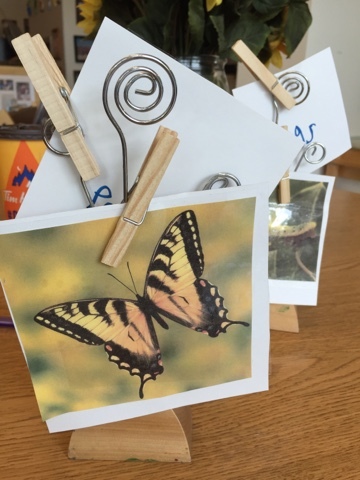 I have written a variety of posts about using a popular butterfly story for developing critical literacy. This post includes links back to several if you are interested. It seems I’ve written rather a lot in response to your post but it’s a topic close to my heart. I’m sure you and your children will greatly enjoy your butterfly encounters. I look forward to reading more about them. Thank you for sharing.